In December 2014, I decided to create a TEDx event in Leamington Spa, England – the town I had been living in for the past year and a half. Had I ever marketed something to the general public? No. Had I recruited or managed a volunteer team? Also no. Approaching this with zero experience in the event space was an interesting challenge. My singular goal going in was this — Create the best TEDx event possible for our audience, speakers, volunteer team, venue staff, volunteer team, and myself. The other trick is this – TEDx events are independently-organized. TED doesn’t give you funding, book your venue, find speakers, choose your theme, handle ticket sales, or find videographers or photographers. That’s all on you. Our volunteer team benefitted measurably – I was told one of the team got a promotion at work as a result of her involvement in the event, and the graphic designer/creative director has said he got several of his longest-running clients as a result of his involvement. The team loved the event enough to keep volunteering to put it on (even after I left England after the first event). It happened in 2016 and 2017 without me and will happen again in 2018. It’s easy finding volunteers…but finding volunteers that get things done is harder. I also spent 5+ months participating as a fly-on-the-wall in another TEDx event’s volunteer meetings to learn more about their challenges. Their event was in May (ours was November), so I figured I could predict our challenges and tasks since they’d be months ahead of us. In February 2015, I was granted the license to run the event. When you start a TEDx event, TED grants you the right to use their branding, but you get almost no other support. They don’t book your venue, staff your volunteer team or much else beyond a profile page on TED.com and access to some social media groups. That is to say, you’re on your own. You somehow have to figure out how to make the event happen without wasting a ton of your own money. So, I did what I knew how to — created a website, a Twitter account, and Facebook page. I added a speaker application form and a volunteer application form, an email subscribe box, and started telling people about the event. This early start (January preparation and research for a November event) was critical, especially because I’d never run an event before. Free videography (BMW had previously worked with our videographers) and photography. At one point we had 3 videography firms competing to sponsor the event. As our influence in the town grew, we also put the word out for donations for goodie bag items for our attendees, speakers, and sponsors. 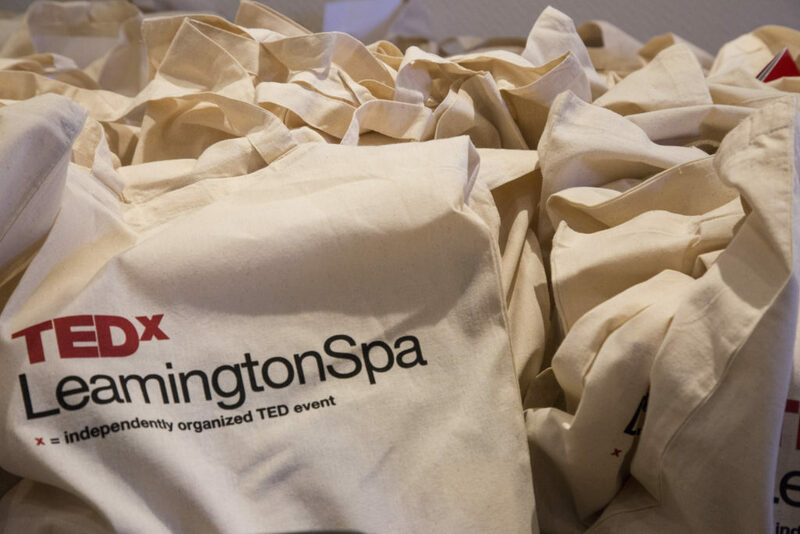 Most TEDx events don’t provide goodie bags, but I felt that this would enhance the experience (and the cloth bags provide an extra ongoing marketing tool as our attendees used them for various errands throughout the year). All this money (and in-kind sponsorship) allowed us to put on an incredible event (and led to our 98% Net Promoter Score) and made sure our audience and volunteer team would be pumped to participate again the following years. Here’s one thing I’ve learned about persuasion and team leadership – figure out what people want, then align their goals with yours. Volunteers, photography & videography vendors, sponsors, speakers, and attendees all want different things. If I could make their life as good as possible before, during, and after the event, I knew things would go well. I asked the volunteers what their career goals were. I ordered sample t-shirts in each size so that everyone got the size that fit well (so they’d feel great wearing it out and about). We ordered hoodies that didn’t have the theme on it so they’d be timeless, and could be worn for years. I also created a company page on LinkedIn and encouraged the volunteer team and speakers to update their professional portfolios accordingly so they could take advantage of their participation in any future career opportunities. I spend 8 hours analyzing different videography styles and photography from other TEDx events so our speakers had high-quality marketing materials to use. Recognizing the fact that they’d be nervous, I secretly asked for notes of encouragement from our 1000-person email list and read these out to our speaker team right before the event. I wanted our speakers to know that, whether their friends or family were in the audience or not, they were loved. Our sponsors all got custom-made graphics they could share to display their sponsorship of the event – I wanted them, to0, to get as much benefit as they could out of being the sponsors of the first ever TEDxLeamingtonSpa. Our attendees got a catered dinner, coffee and tea, wine/beer, and a gift bag full of vouchers from local businesses, all included. The value of these freebies alone easily exceeded the price of the ticket, and could only have been possible with the sponsorship we received. I knew that our email list size was critical to our ability to sell tickets. Many TEDx events apologetically hide their subscribe form behind another button or at the bottom of the page, but we used a popup to make sure we captured as many subscribers as possible. By the time we launched ticket sales, our email list had reached 1000 (comparable events told me they had 125 subscribers in the same timeframe). The second realization I had was that people don’t buy tickets to a TEDx event because of the speakers or ideas. After all, they can easily stay home and pick and choose which talks to watch for free on YouTube. This runs counter to what most TEDx events actually position themselves as in their sales emails – they focus on the speakers, the theme and the exciting messages the speakers will share. Instead, I realized that attending a TEDx event is an experience that has almost nothing to do with the talks. Attendees would value primarily from being in the same room as some of the smartest people in town. They’re on the inside. In the club of ambitious, entrepreneurial creatives. To that end, my copywriting in emails leading up to our ticket sales focused on this. I have no doubt that these two strategies were keys to us selling out our unusually expensive tickets (£55) in a small town (50,000 people) and a first-time event in just 73 minutes. I knew that speaker procrastination was a major problem from my research with other TEDx organizers. Some speakers simply delayed preparing their talks until the last minute. Quality suffered. On the other hand, we couldn’t simply ask anyone to submit a full talk to us for consideration. Though this would avoid the procrastination problem, it would create a massive barrier for potentially great speakers that didn’t want to write a full talk without some reassurance that they would be selected. It would also mean a great deal of work for us, reviewing far more talks than we intended to select. To that end, one of the volunteer team designed a staged system whereby we’d ask first for an application form to be filled in (with basic contact details, some notes on their proposed talk, and so on), a month later, we asked for a 1-page summary of their talk, and finally, a rough draft of their complete talk. At each stage we narrowed the pool of speakers, to save us time, and provide the speakers the affirmation that they had been selected for the next round. We also (somewhat accidentally) had our dress rehearsal scheduled for 3 weeks before the event. In the end, speakers had the first draft of their talk done 3 months before the event and a dress rehearsal (in front of an audience of family and friends) 3 weeks before the event. I’m certain that this structured preparation was a major contributing factor to the end quality of our talks. I learned while being a supervisor at Burger King in my high school days that a great manager looks lazy. If the head of the show is running around looking stressed, they’re not very good at management. To make my life easy on event day (I’d be the host of the event as well), each volunteer group was given a checklist. I had one of my own that I used, which contained everything from prep in the days leading up to the event (go to the gym every day, drink 4L of water, don’t drink alcohol) pre-event prep (bring lip chap), what happens before guests arrive (don’t drink too much water, make sure you go to the bathroom), to how I would introduce each speaker. In short, I wanted to outsource all of my thinking to a piece of paper, so I would be able to save as much of my mental energy for other things. Our teams each had their own system (one for guest check-in, one for A/V, and so on). On the day, it was truly easy. I owe this thinking to The Checklist Manifesto. Anyone can apply for a license to run a TEDx event. To do so, check out TED’s guidelines for organizers.